This is a very nice surprise. 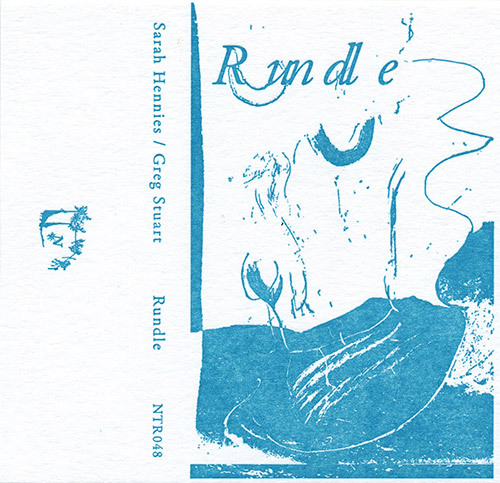 Most of the music I've heard from Hennies in recent years (doubtless missing much) has been comprised of stripped down, careful explorations of very subtle sonic phenomena and rhythms, sometimes akin to some of Alvin Lucier's work. And apart from Stuart's collaboration with Joe Panzner (Dystonia Duos, ErstAEU, 2013), I'm almost entirely familiar with him via his work on the pieces of Michael Pisaro and other related composers. On this cassette, I think everything is improvised (though perhaps with some "signposts"? ), the results much rougher and freer than I would have expected. On Side 1, 'Tunnel', they do a fine job alternating between free portions, with quiet rustling on various small percussion, and quasi-structured portions with piano and vibraphone, lovely swathes of slow pulse augmented with rapid flurries. These approaches are also as in a lovely section about 13 minutes in with sustained, ethereal piano and delicate scrabbling that almost sounds like dry leaves or twigs rubbed on a hard surface. 'Basin' is rougher still, with less in the way of footholds, irregular clangs of metal (perhaps thrown or dropped) amidst skitters, pops, rubbings and more. Like 'Tunnel', the track is expertly paced, with the slightest inclusion of brief, regular taps on wood blocks providing the most gossamer of structures within the fine clatter for most of its duration. A cloudy vibes figure ushers in the final section, providing a bed for abstract, lightly metallic and wooden activity, intricate and abstract. Excellent work. Matt Hannafin has put together an extremely engaging and, dare I say, accessible collection of actualizations of Cage pieces. While I've heard each of the works in a number of different contexts/instrumentations, I don't know them well enough (much less the scores) to offer any comparisons, so will only treat them as...found objects. 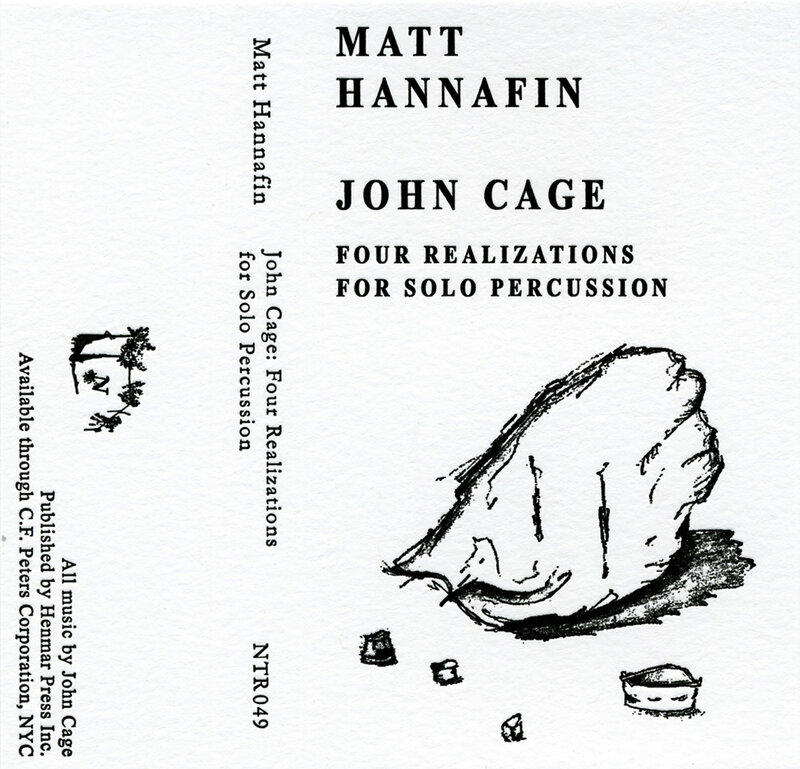 'c¢omposed Improvisation for One-Sided Drums With or Without Jangles' finds Hannafin beginning by making loose, airy but percussive sounds (he seems to have included the jangly bits), moving on to deeper tones but everything relaxed and allowed to breathe in the room, tumbling gently, with a very natural, irregular cadence. 'Variations III' is approached with tuned wood blocks and toms (I think), Hannafin again developing very unforced quasi-rhythms--reminds me of a calmer Xenakis sometimes--, the strikes rolling and falling with the unassumedness of raindrops. Oddly, there are certain pulses and sonorities that recall parts of the great 'Dialogue of the Drums' by Andrew Cyrille and Milford Graves. The aural space is once again finely navigated in 'Variations II', with much ringing metal, breaths, jangles, heavy drum smites and more, all with a wonderful sense of air between the sounds. 'One4', a late number piece by Cage, closes things out, with resonant bowed metal spiraling out into the silence-- succinct, no more than necessary, just perfect. Really one of the finer recordings of Cage percussion works I've heard in quite a while.